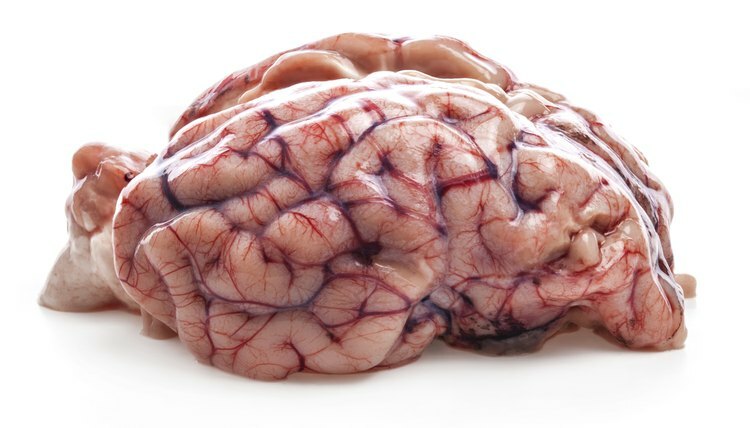 Sheep brains are readily available from scientific vendors as dissection specimens, making them a popular choice in neuroanatomy classes, where the ultimate goal is to learn about the human brain. This is possible because the sheep brain and human brain are very similar. However, there are some key differences that should be kept in mind during dissection. The sheep brain and human brain are very similar in overall structure, as are all mammalian brains. Each contains a cerebrum, cerebellum, and brain stem. The sheep brain is smaller, weighing around 140 grams, or about one-tenth of the weight of an adult human brain, though it is still large enough to be easily dissected. The cerebrum is more elongated in sheep than in humans, and the cerebellum and brain stem are located behind the cerebrum, instead of being tucked below it. This is because sheep, being four-legged animals, have a horizontal spine, while humans stand upright with their spines vertical. A major difference is that the frontal lobe in the sheep brain is much smaller relative to the overall brain size, accounting for only a few percent by volume compared to about 25 percent in the human case. The frontal lobe is connected with higher cognitive functions, such as abstract thinking and analysis. The relative size of the frontal lobe, as well as the number of ridges in the cortex, are indicators of species intelligence. Though the sheep has generally been regarded as an unintelligent animal, it is increasingly recognized that sheep are able to perform some advanced tasks, such as remembering the faces of other sheep and humans for two years or longer. The sheep, like many mammals, has a more developed sense of smell, or olfaction, than humans do. The olfactory bulb is the part of the brain located underneath the frontal lobe that is responsible for relaying sensory information from the nose to the rest of the brain. The olfactory bulb in sheep is two to three times the size of the human olfactory bulb, despite the sheep brain being much smaller overall. This reflects the importance of the sense of smell to the sheep. In addition to helping it understand its surroundings and avoid danger, sense of smell also plays a crucial role in establishing the bond between mother and infant, known as imprinting. The optic chiasm is a cross-shaped structure centrally located on the underside of the brain where the optic nerve fibers from each eye partially cross over to the corresponding optical tract on the other side of the brain. It is more pronounced in the sheep brain because sheep, like many prey animals, have eyes toward the sides of the head that operate more independently, giving the sheep a much wider field of vision. Therefore most of the visual information from each eye crosses over. Humans have more frontal eyes, and share information from each eye more evenly between the brain hemispheres to enable complex visual processing tasks, such as depth perception.